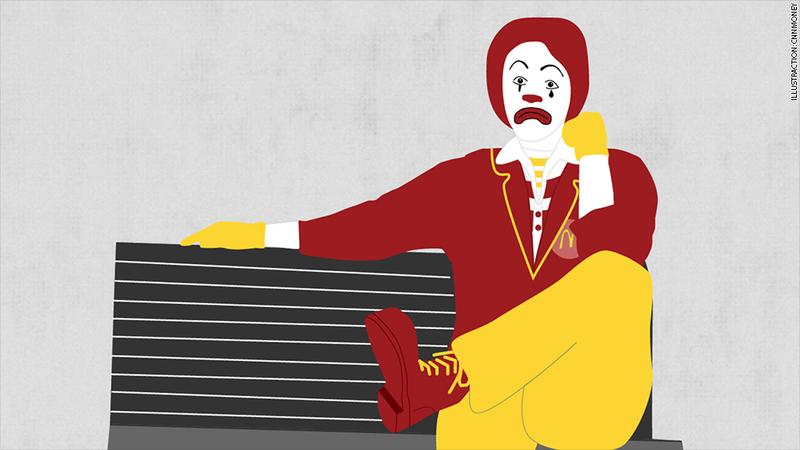 Ronald McDonald may need more than a new look to pacify franchisees upset with McDonald's slumping sales. Ronald McDonald has a new coif and a jaunty red blazer. But a makeover won't help much when he gets in front of some angry franchise owners at the McDonald's (MCD) Worldwide Convention in Orlando this week. Franchise owners don't appear happy with the company's management in Oak Brook, Ill. Competition is heating up, especially at breakfast, and sales are hurting. Breakfast accounts for 25% of McDonald's sales, and the business is under attack. Yum! Brands (YUM)' Taco Bell just fired a salvo with the "Waffle Taco." Starbucks (SBUX), KFC, Subway and even White Castle are now going after the morning crowd with new offerings. Mickey D's countered with free coffee that lasted 2 weeks. In the first three months of this year, McDonald's same store sales fell nearly 2%. Franchise owners want new ideas to help turn things around. But fast food consultant and former franchisee Richard Adams doesn't expect much from headquarters. Adams' company, Franchise Equity Group, has surveyed 219 U.S. McDonald's restaurants and 27 franchisees for the past 12 years. The latest results weren't encouraging. Franchisees were asked to quantify the current relationship with the McDonald's corporation using a scale of 1 to 5 (1=poor and 5=excellent). The average response was 1.73, well below the average over the history of the survey. "Giving away free coffee - what a brilliant, creative idea from the geniuses in Oak Brook." "Upper management and supporting departments are out of touch. We're spending like crazy on new equipment. Very little return." "Oak Brook management is out of ammo. Maybe we'll hear some new ideas at the convention." Adams said franchisees are also concerned that the McDonald's menu and pricing has grown too complicated. According to Technomic, a fast food consultant, the average McDonald's menu has 124 items throughout the serving day. That compares to about 104 items on Burger King (BKW)'s menu. "It has to simplify the menu," said Adams, who argues too many choices slows down prep time and service. Last year, the average drive-thru service at McDonald's outlets nationwide recorded its slowest pace in at least 15 years, according to a recent report from fast food research firms QSR/Insula. The report blamed its complex menu for the delays. Franchise owners are expected to pipe up this week and also at the McDonald's shareholder meeting later in May. "When we come together for global meetings such as our convention, there is always open dialogue and feedback on how we can continue to evolve our business and best serve our customers," McDonald's said in a statement.